It’s easy to see why Seaside was named “Best Beach on Earth” for families by Travel + Leisure magazine. A central hub of South Walton, this iconic town is a pioneer of the New Urbanism movement and became a model for the development of Scenic Highway 30A. Picket fences frame pastel colored beach cottages in this friendly town where locals and visitors gather for festivals, concerts and fun. Nine unique beach pavilions provide access to the Gulf, in addition to Seaside’s two newest boardwalks outside Bud and Alley’s and the Coleman pavilion. Savor delectable paella alfresco at 45 Central or dig into Murphy’s famous mac and cheese at the Barefoot BBQ Airstream. Visit the diverse collection of shops on Central Square and in Ruskin Place, including Modica Market, unique art galleries and specialty boutiques. Hidden away in Seaside’s Central Square is “The Rep,” a 75-seat theatre renowned for its innovative theatrical and musical performances. Does Seaside look familiar? It was featured prominently in The Truman Show, the 1998 Academy Award-nominated film that provided star Jim Carrey with his first Golden Globe award. 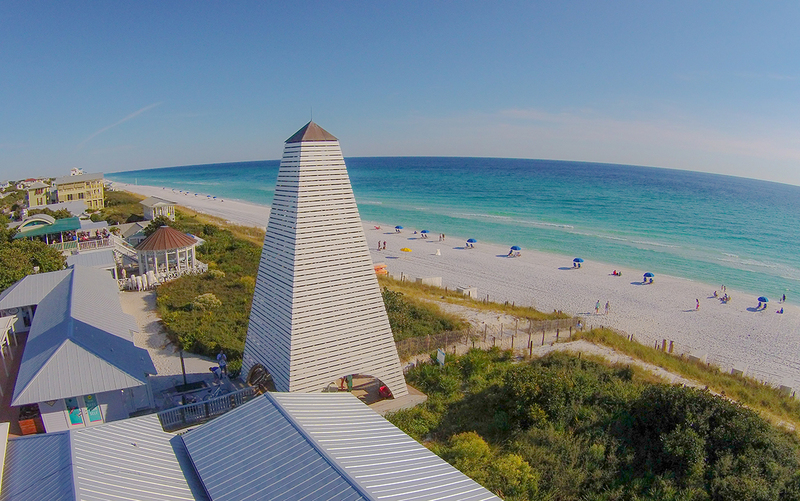 Watch closely for Seaside proprietors and 30A locals throughout the film!